Gandhi’s Pocketwatch and Items Close at $2.1M. Hilarity Ensues. – I Already Have a Watch. Gandhi’s Pocketwatch and Items Close at $2.1M. Hilarity Ensues. Antiquourm Lot #364 in the March 4-5 Auction: Gandhi's Zenith Alarm Pocketwatch, Eyeglasses, and Sandals. Photo: Antiquorum. New and Even More Bizarre Events in Antiquorum Auction of Gandhi Pocketwatch and Memorabilia. This afternoon Antiquorum completed the auction of lot #364, which included a Zenith alarm pocketwatch, eyeglasses, sandals, and bowl and plate that had belonged to none other than Mohandas Gandhi. As I predicted in earlier posts, the initial estimate of $20,000-$30,000 proved to be absurdly low and the auction closed at approximately $1.8 Million US dollars (or $2,096,000 (including the buyer’s premium), with an Indian billionaire the winning bidder. 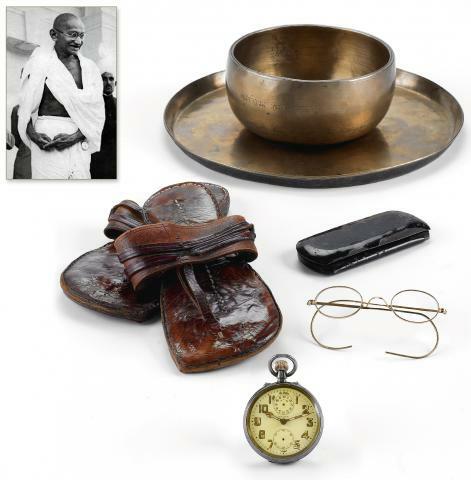 Antiquorum lot 364 - Gandhi's personal items. Hammer price of almost $2.1 Million including buyer's premium. As I wrote previously the auction had generated a fair amount of public outcry in India, to such an extent that a Delhi High Court had even issued an order to stay the auction on behalf of Gandhi’s legal heirs and the Indian government was even considering going as far as bidding directly in the auction. But since the Delhi court has no jurisdiction in New York, the Consul was reportedly prepared to approach a New York court asking them to enforce the order. But apparently before that could even happen US seller James Otis (also news to me – earlier reports attributing the sale to German collector Peter Ruhe were apparently in error) offered to cancel the sale if the Indian government agreed to support better health care for India’s poor and to support educational efforts promoting Gandhi’s nonviolent ideals. And despite previous statements to the effect that India would agree to no conditions, an agreement was supposedly reached as late as this morning. And just to make things even more bizarre, Otis apparently announced his inention to cancel the sale either immediately before the auction or after bidding was already underway (reports conflict). In any case, Antiquorum proceeded with the auction, which closed at a hammer price of approx. $1.8M ($2.1M with buyer’s premium). The winning bidder was reported to be Indian billionaire businessman and parliament member Vijay Mallya. However, owing to the controversy and unusual circumstances Antiquorum has reportedly agreed to postpone the finalization of the auction for two weeks. It just doesn’t get much more bizarre than this, even if we were already expecting something strange. It’s still not even clear to me who owns Gandhi’s items or where they’re headed. Tagged with antiquorum, gandhi, zenith. I had read that the Mahatma an Ingersoll Dollar Pocket Watch on a piece of twine, looks like he wanted a little more precision planning his schedule. I’m guessing the Zenith was a gift or honorary of some sort and the Ingersoll was the Mahatma’s beater.